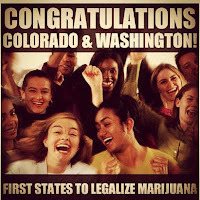 Colorado and Washington Legalize Marijuana ! In a historic turn of events, a majority of the people from the state of Colorado and Washington voted in favor of legalizing the recreational use of Marijuana allowing anyone over the age of 21 to possess up to an ounce of Marijuana and for businesses to sell it. This is definitely a major step forward in creating more awareness of the sacred herb known for its therapeutic value and used by man for more reasons than one. Recent scientific studies which have also concluded that smoking marijuana does not cause cancer as some would like us to believe. On the contrary smoking the reefer actually showed an increase in lung expansion among regular smokers. "The significance of these events cannot be understated," said NORML, a pro-legalization organization, in a news release. 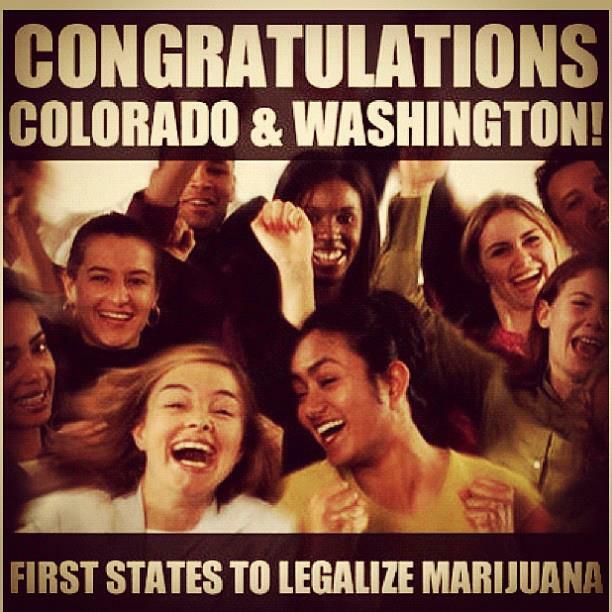 "Tonight, for the first time in history, two states have legalized and regulated the adult use and sale of cannabis." "The voters have spoken and we have to respect their will," said Colorado Gov. John Hickenlooper, in a statement. "This is a complicated process, but we intend to follow through. However, Marijuana still remains illegal for the Federal Government which overrules states' rights and the feds will do all that they can to interfere with Marijuana legalization in any state. Does seem like a last ditch effort by the powers that be to keep humanity enslaved under inane drug laws, however making Alcohol and Cigarettes easily available to the masses which take more lives than all drugs included. The CIA and the US military forces are also known to be involved in drug trafficking and in controlling the Opium fields in Afghanistan. In 2007 a CIA torture jet (Gulfstream II) crash landed in Yucatan, Mexico with 4 tons of Cocaine on board. However, this wasn't the first time something like this has happened. On April 10th, 2006 another plane (DC9) was busted at a rural airport in the Yucatan, Mexico, with 5.5. tons of cocaine on board. Its high time people wake up to the truth and shake this corrupt system from its very foundations and bring about a paradigm shift in the way we live our lives on Planet Earth. Popeye The Stoner : Adventure in the High Seas ! Wow! Qué noticia tan sorprendente!